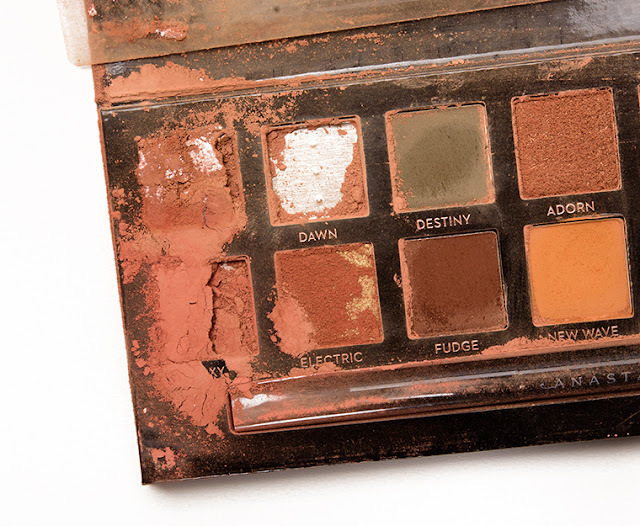 Has there ever been a palette that has caused more controversy than this one? I think not. 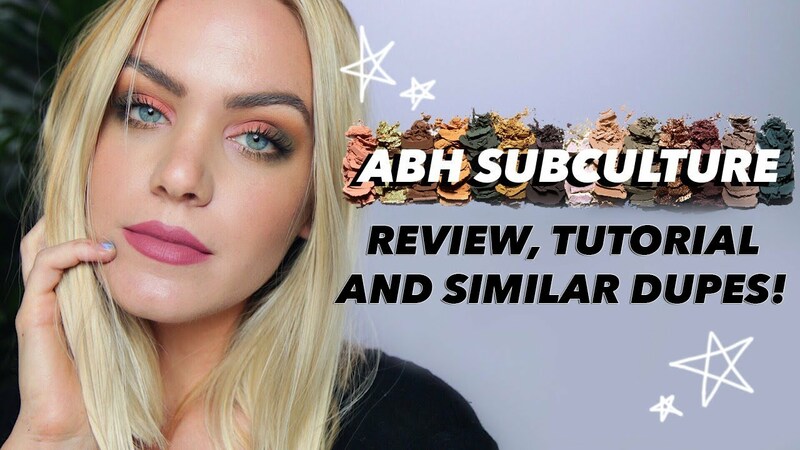 I don't want to bore you with my take on the whole ABH Subculture Palette* (£41) debacle but I have had a few questions about this palette and whether or not I am going to buy it. My thoughts on it etc. 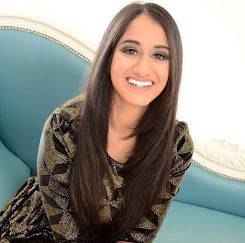 This post will address all of that, I want to give you all as much information as possible and then you can make your own informed decision on whether this is worth the mulah, I will have a tonne of reviews and tutorials linked at the end of the post, just click the link of the YouTuber you like the most and their review or tutorial will open up in a new page. I will also have some dupes included from several of my favourite instagram accounts which will all be linked and credited as well. Addressing the issues, obviously the fallout is excessive. I have the Modern Renaissance Palette and the Master Palette by Mario. In my experience, The Modern Renaissance palette* (£41) is perfectly manageable. The fallout hasn't been too much for me. It has worked fine, yes there is fallout, but the pigmentation and formula are actually great. Hence why their first permanent palette was such a massive hit. I have The Master Palette as well, and truthfully although the colours are my complete cup of tea I barely reach for it. I cracked it open the other day to use a couple of shades and I found the fallout to be quite a lot. 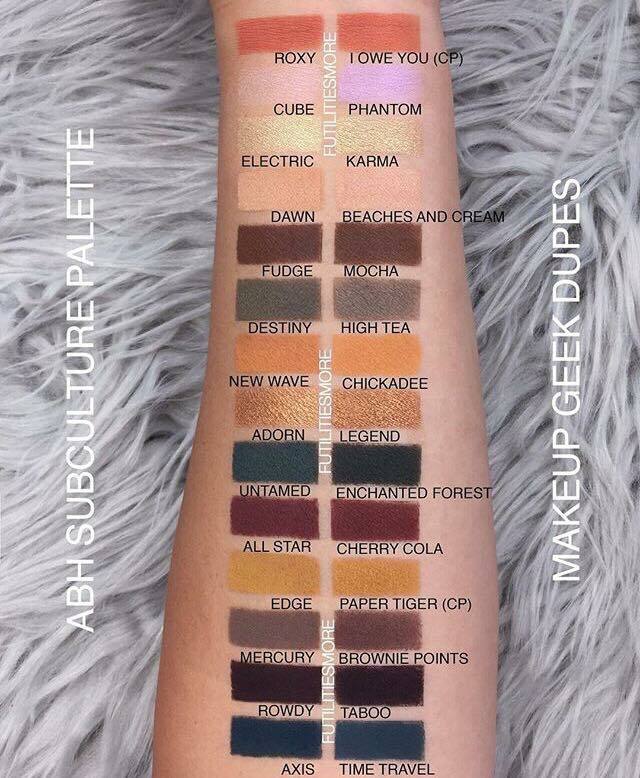 Definitely comparable to what I have been seeing online about the Subculture Palette. The kickback is an issue and as it has that suede finish the palettes easily get dirty, There are some palettes that are extreme to the point of people hitting pan and because the shadows are so softly pressed to keep the pigmentation you have to be very gentle. Kickback and fallout is something everyone can get over but I have seen issues with blending and what bothers me the most is that the colours don't appear true to pan. They translate differently on the eyes, New Wave appears a lot darker and muted. Plus when you blend some of the shades together it turns muddy. I am not buying this palette because of how the shades appear on the eyes and how much it seems to be a struggle to blend. Also the colours don't scream to me personally. It looks beautiful, but it would end up being a palette that gets used once only. I don't think the shades work that well together in terms of colour selection, but I was tempted to buy it because I have seen some great looks. I was tempted to do a giveaway with it, would you still be interested? 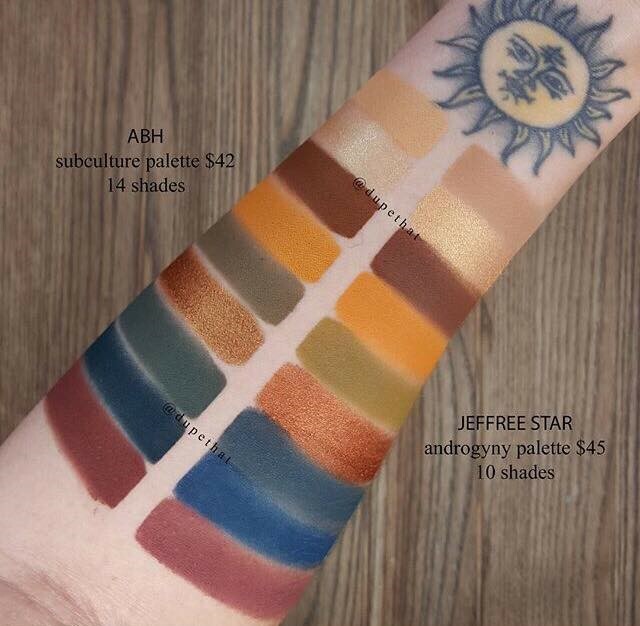 The Androgyny Palette* (£40) from Jeffree Star Cosmetics has 9 similar shades out of the 14 in the Subculture Palette so if you already own that then I don't think you need this at all. This photo is from the account @dupethat an amazing account. The photo below is from @futilitiesmore which has dupes from Makeup Geek. I think Makeup Geek is a brand a lot of people trust when it comes to their formulas and their ethos. Nothing is rushed, even their collaborations have all been received really well so major props to them for being consistent when other brands seem to be cutting corners. That is all I have to say about it. I won't be considering buying this palette until they address the concerns raised. My room and makeup station is already too much of a mess as it is, the last thing I need is another shadow covered palette. The colours that stood out to me are Roxy, New Wave, Untamed, Edge and Axis. Unfortunately these are all the colours that seem to be giving everyone the most trouble, they oxidise on the lids, refuse to blend and just look a bit of a mess unless you take the time to work with it. From Makeup Geek, in my opinion Phantom looks a million times better than Subculture's Cube, same goes for Paper Tiger and High Tea. Everything is very comparable and if not similar they at least seem more pigmented and smoother swatched on the arm. Below are all the tutorials, reviews and dupe posts I have watched, feel free to watch whichever you want. Fair warning I watched a bloodly lot so please hold on the judgement. These were all the ones I watched over the past month or so, and not all of them are bad reviews. I think everyone was pretty fair and balanced. 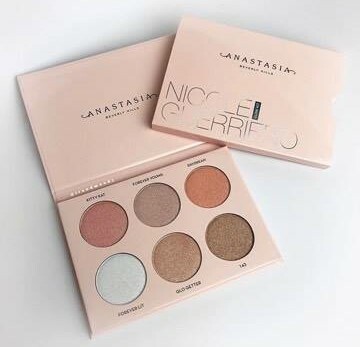 I would love to know your thoughts if you have the palette, are you considering getting it? Do you even like it? Let me know in the comments. 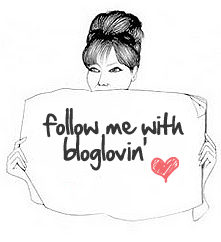 Thank you so much for reading, I really hope you found this helpful. Have a lovely weekend. Take care. 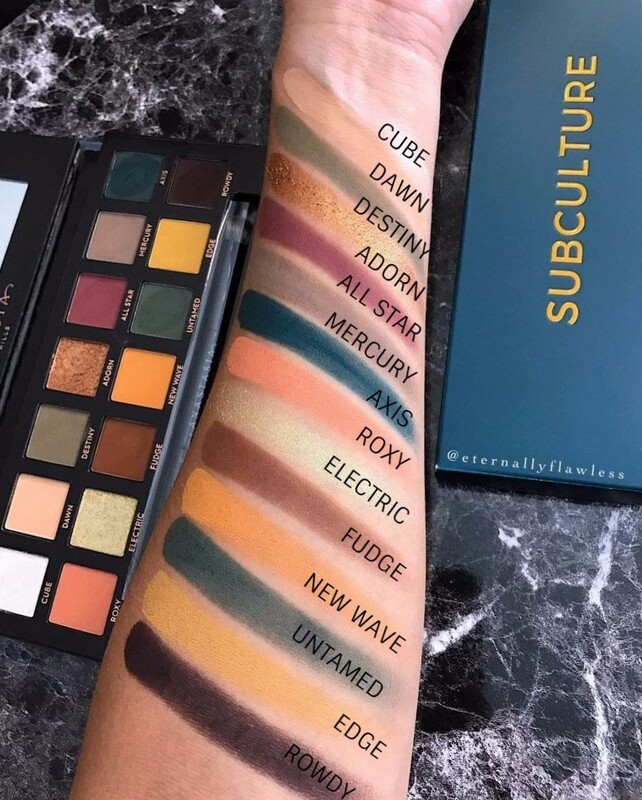 What are your thoughts on ABH Subculture? I'm still on the fence over it, I have it, and really enjoy using it, but I agree with the reviews. The beauty News one is the best by far! They are SO good! I did a similar post on my blog where I looked at what I think actually went wrong. It's crazy how much drama was about this one palette! I love that you included compassion swatches with the Androgyny palette. - I had no idea there were similar shades! I don't think I'd like this palette either, though I also have and love the Modern Renaissance and the Master Palette! I actually reach for my Master Palette a lot and I don't notice as much fallout as the Subculture, though there are mostly shimmer shades in there. These shades looks really pretty and so pigmented! Thanks for this extensive review of this palette! I'm not an expert but I appreciate all your advice. Will steer clear! I like the shades but I am not very sure if I'd use most of them very often or even at all. I think i'm going to skip out on this one. Personally I doubt i'd use majority of the colours and i'm not a fan of how fall out there is. If i'm paying a decent amount for a palette I would rather it last awhile. Wow. I feel like lately all I read/hear about are negatives towards eyeshadow palette's. There's such a rage for them currently and I can't help but wonder if companies are cheaping out just to cash in. I've never actually used it - but it's interesting to hear that a palette can cause so much drama! Looks like some really good dupes though - especially the Makeup Geek shades. I'm undecided on this palette! I'm just waiting to see bloggers I trust come out with their reviews on it! I love ABH Modern Renaissance, but I won't buy this one. First I love the colors but I know I won't wear them, second with all the drama I'm afraid of getting a bad palette. This one is a pass for me, hope in the future she launches better ones! I've heard nothing but negative news on this palette and it's for most of the reasons you've mentioned in this post. Though I'm not a makeup junkie, I do love watching makeup tutorials and enjoy knowing about the latest collections, if I do decide to add one to my collection. It's crazy how the dupes look nearly identical and the quality from what I've heard from both brands are pretty awesome, especially Makeup Geek. I don't know why ABH is lacking in quality, perhaps they're experimenting with new formulas? Still, the experimentation should never be released until it's proven effective to protect the brand's name. Anyway, thanks so much for sharing your honest thoughts with us, girlie, and I hope you're having a great start to your week so far! I wasn't thinking of getting this palette but after watching Stephanie Nicole's review on it, I am tempted to pick it up. I wish they were more forthcoming about the change in formula, this palette takes so much work.